Contrary to initial GCC media statements confirming the adoption of new model contract for domestic workers, sources say no new changes were discussed at the November 2014 meeting. The media fanfare surrounding the meeting of GCC labour ministers in November has quickly proven overzealous; while the meeting was set to resolve states’ disagreement over clauses in the draft contract, instead commitment to reform fell short, the objective of the contract ultimately diluted. The meeting resulted in more promises to implement reform at home, but not in the new regional contract announced by media outlets - apparently misled by GCC officials who quietly retracted the ‘landmark’ announcement one week later. The confusion is neither incidental nor uncommon; since the draft contract first emerged in early 2013, GCC states have eschewed transparency and avoided accountability through purposefully ambiguous rhetoric. The refusal to release drafts of the contract prevented civil society and other stakeholders from providing valuable perspectives and input that help to ensure the comprehensiveness of reform. In May 2014, a GCC labour council official told Migrant-Rights.org that states would not be bound to the unified contract, but that the contract would instead provide a model from which states could select elements to implement (or ignore). Over the past year, several GCC states indeed implemented domestic worker reforms, many included in new bilateral agreements and new standard contracts. Some of these reforms overlap with clauses in the last known of version of the draft contract. However, many of these reforms apply selectively to workers from certain countries of origin, a consequence of the uneven impact of bilateral agreements. Civil society organizations welcomed a standard unified contract because it could provide for a much-improved baseline for all domestic workers. Domestic workers across the Gulf endure similar conditions, including unpaid or late wages, various forms of abuse, and restrictions on mobility. 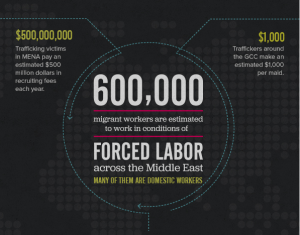 Kuwait, Oman, Qatar, and the UAE all exclude domestic workers from their labour laws. Bahrain’s 2012 law offered annual vacations and access to mediation in labour disputes, yet it fails to grant them rest days, minimum wage, and specified working hours. Since its adoption in 2011, no country in the Middle East and North Africa has ratified the International Labour Organization’s Domestic Workers Convention. Read more here. Additionally, ITUC’s recent report Facilitating Exploitation: A Review of Labour Laws for Migrant Domestic Workers in Gulf Cooperation Council Countries shows how national labor laws in GCC countries partially or completely exclude millions of domestic workers. Yet, officials repeatedly fail to acknowledge the severity of domestic worker issues; in October, Emirati officials refuted HRW’s report on domestic worker exploitation in the UAE, arguing that the cases documented represented anecdotes rather than indicators of insufficient legal protections. Authorities also failed to recognize that systematically weak enforcement mechanisms render compliance with existing regulations, such as those criminalizing passport confiscation, effectively voluntary and therefore very low. Officials furthermore refuse to acknowledge that across the region, the justice system appears incapable of resolving these ‘anecdotal’ cases. The UAE and other GCC states have issued similarly hostile responses to reports by the ILO and other organizations in the past. The unified contract would not have been a panacea; it is not a substitute for inclusive labour laws, and it does not resolve the deep-rooted issues that traverse migrants’ experiences, such as deceptive recruitment or obstacles to accessing justice. But the unified contract represented a critical intermediary step towards more complete legal reform. Each year GCC states recycle the same promises for domestic worker reform, and each year the changes actually implemented are marginal at best. The effort exerted to combat the findings of NGOs and academics far exceeds the commitment to ensuring decent work for domestic workers. The failure of the Gulf states to implement meaningful reform, and their deliberate obscurity and incoherence in doing so, evidences the low priority accorded to protecting domestic workers and other migrant laborers.